Lately, I’ve been questioning whether my caffeine intake has exceeded its limit. Admittedly, it’s time to come to terms with my coffee addiction, but the slight idea of a coffee detox would only induce major migraines and crying. Like many others, coffee consumption has become mandatory before starting the day. You know there is a problem when the majority of your monthly expenses go toward coffee rather than food or clothing. Don’t get me wrong, I’m nowhere near overdosing, but it’s safe to say that I’m extremely thankful to live within walking distance of the RIVAL Bros. coffee truck. 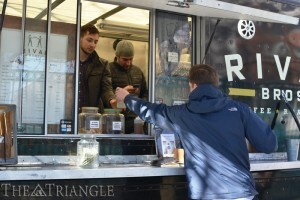 Aditya Kothiwal – The Triangle: RIVAL Bros. coffee truck, lovated on 33rd and Arch streets, is the product of restaurant industry gurus and Philadelphia natives Jonathan Adams and Damien Pileggi. My love affair with coffee has been a long, winding road of seeking out only the best roasts. As an avid coffee drinker, I enjoy learning about the origin of the roast, blends and elevation, while making it a priority to consider the overall taste. From Starbucks to La Colombe, I’ve tried it all. But until RIVAL Bros. parked its truck on the corner of 33rd and Arch streets on Drexel’s campus, I was never truly satisfied. After experiencing RIVAL, I’ve come to learn that the key to satisfaction is simply to rely on the true flavor of the coffee rather than diluting the roast with syrups and sugars. RIVAL is the brainchild of Philadelphia natives and longtime friends Jonathan Adams and Damien Pileggi. Both are well known among the restaurant industry and have an inherent passion to brew a perfectly balanced roast. Adams was previously the executive chef at the popular Pub & Kitchen in Philadelphia and the Diving Horse in New Jersey, while Pileggi is known for his plethora of roasting knowledge as an artisanal coffee expert with more than 12 years of coffee-brewing experience on both the West and East coasts. The original blends at RIVAL include Whistle & Cuss, which is a complex, sweet, toasted roast accompanied by a hazelnut berry finish; and the Revolver, which is a rich balance of a chocolate spice finish. The Palooka is a decaffeinated, bold, round toffee with a thyme finish. Blends aside, the best part about any RIVAL brew is the freshness. Unlike most cafes, RIVAL roasts the customer orders as they come in, providing a hot, fresh cup of coffee that won’t offend your taste buds. Most notably, each batch is dated the day it is roasted, not by when an individual should consume it. Along with freshness embodied in every sip comes a surge of simplicity. To compare, RIVAL roasts much lighter than Starbucks, doesn’t carry flavored syrups and only offers one size. Not to mention, you won’t be forced to wait in a never-ending line. Co-owner and barista extraordinaire Pileggi said, “The roast is really simple but extremely flavorful,” duly noting, “the coffee has its own character in which customers won’t have to use add-ins.” In other words, RIVAL lets the coffee speak for itself. The simplicity in RIVAL’s product has been not only the key ingredient of their aesthetic, but it has also aided the company in blending West Coast, third-wave coffee roasting with a touch of East Coast sensibility for citizens who are looking for a cold-weather, caffeinated cup in a hurry. For the sweet tooth out there, don’t fret. RIVAL specializes in tasty, well-portioned lattes and cappuccinos! As an integral part of Philadelphia’s buzzing artisanal coffee scene, which has certainly gained traction over the past five to 10 years, RIVAL seeks to curate only the freshest, perfectly pressed, handmade roasts. RIVAL has also developed its own single origin program, featuring one to two coffees at a time from places around the world such as Latin America, farm to farm, and co-op to co-op, making its mark as an organically, handmade-focused coffee spot. For students who need a quick, convenient coffee spot, the efficiency at RIVAL will get you to those early-morning lectures on time and offer you the freshest coffee on campus! RIVAL operates at 33rd and Arch streets every Monday and Wednesday from 7:30 a.m. to noon and Tuesday and Thursday from 7:30 a.m. to 2 p.m. The truck is closed Fridays. Follow them on Twitter for new updates @rivalbroscoffee and check out http://www.rivalbros.com to shop.